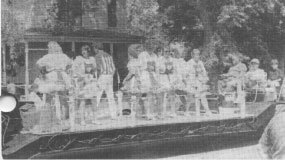 Milo High School was founded in 1895, and celebrated its 100th Anniversary on the Fourth of July Weekend in 1995. This page contains pictures and articles from that event. MILO – Milo High School’s 100th anniversary activities drew to a close Jul) I with a banquet at Penquis Valley High School where well over 750 were served. 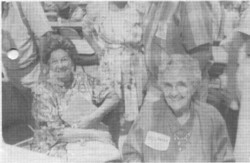 ‘the meal was provided by Betty Willinski Willett and her crew. 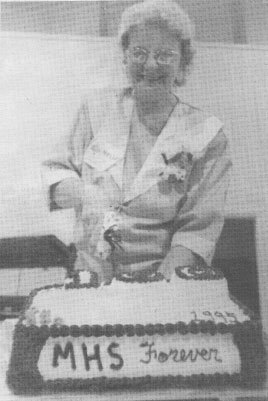 Directly following the meal, Myrna Ricker cut the anniversary cake and Georgia Hamlin (Class of 1967) served the first piece to her grandmother, Pearl Hamlin (Class of 1916). the oldest living MHS graduate. Lawrence and Myrna Ricker were recognized for all their hard work and planning of the 100th anniversary celebration. The couple was presented a print of MHS drawn by Allen Monroe of Milo. DeWitt. treasurer: and Karen Clark, scholarship chairperson. 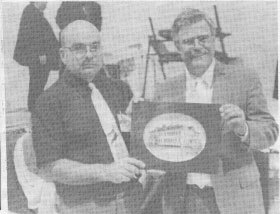 DeWitt was also presented a print of MHS in recognition of the fine job done as treasurer, especially this past year with all the extra work involved forthe I 100th anniversary celebration. An auction was held with Robert Hamlin (Class of 1940) as auctioneer A large black and white (MHS school colors) afghan “as donated by Gloria Lutterell, of Milo. Raffle winners were drawn: Richard McCorrison won the land and the five winners of $100 bills, were Torn Kennedy, Jane Barlow, Lona Gediman, Henry Williams, and Susan Larson. Guest speaker David French (Class of 1956) spoke of his life at MHS, his work with CNN News as anchorman, and his current work with the Central Intelligence Agency. He explained he left CNN to go to the CIA because the work is more challenging and exciting. He added that while living in Milo he learned how to love and to be loved. French recognized Pearl Hamlin (Class of 1916) for being the oldest living MHS alumnus. French related humorous stories from his high school days and his days with CNN. He also spoke of his old cat, Sam, who was adopted by Myrna Ricker after French left Milo. In conclusion, French thanked everyone, especially the teachers. He then received a standing ovation and was presented with a print of MHS and a package of stationery with drawings of Milo on it, all done by Allen Monroe. 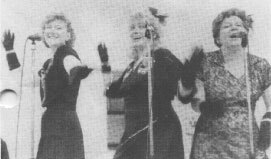 The evening wound down with musical entertainment by the “Memphis Belles” who sang songs from the 1930s, ’40s and ’50s. MHS Alumni co-president Neil Hamlin presented the evening’s guest speaker, David French, with an original colored drawing of the Milo High School building done by local artist Allen Monroe. Mr. French reminisced about living in Milo, remembering events during his time at MHS. He also told about his work as a news anchor at CNN especially during the Gulf War. He now works at the CIA but always enjoys “coming home”. Mr. French is a member of the Class of 1956. MILO – One hundred years have passed since Milo High School graduated it’s first class. 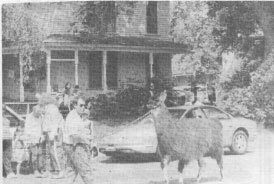 In horror of’ the centennial, alumni planned a weekend of :elebrating that brought lots of people and festivities to Milo from June 30 to July 2. Friday started oil hot and muggy as the weekend’s festivities began. Store fronts were decorated with pictures of MHS graduates and memorabilia from the MHS era. As people began to arrive in \lit(, I’m the weekend’s events. they were able to spend time walking along Main Street and reminisce about their high school days. Activities kicked off Friday evening Aillb a tasty supper served at the Pleasant Pail, Community Building. The meal was prepared by Freda and Everett Cook of’ Milo. The meal was followed by an evening of dancing, with a quan: dance at the Milo Town Hall and line dancing in front of Penquis Valle) High School. Walter Lougee was the caller for the square dance and Carrie Ade led the line dancing. Friday came to a grand close with an outstanding fireworks display shot off from the middle school soccer field. The kics were lit Lip with a large variety of colorful designs as the fireworks exploded in the air. It was the first fireworks show people had seen in Milo for many years. 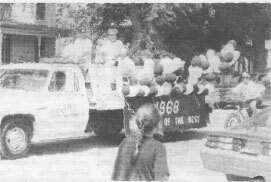 Committee members and volunteers rose early Saturday to begin decorating orating Main Street with balloons and other decorations. Though a shower passed through, the decorating was accomplished and the tiect looked great for the big parade. Piscataquis Masonic Lodge hosted a pancake breakfast Saturday morning, with masons preparing the meal. Coffee and donuts prepared by Willis Lancaster “ere cr%cd at the Milo Town Hall while alumni were arriving for registration. Under sunny skies, the bell on the old grammar school rang and the parade began. led by Chief Todd Lyford of the Milo Police Department. Lyford was followed by Three Rivers Ambulance, Milo Fire Department, Piscataquis County Sheriff’s Department Color Guard, Grand Marshal David French. Shrine Band. 100th Anniversary Cake by PVHS Student Council. Pearl Hamlin (Class of 1916) and Grace Doble (Class of 192 1). 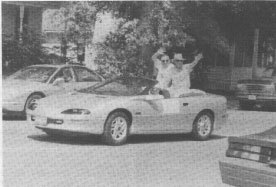 Mr. and Mrs. Richard Sawyer (Sawyer was superintendent at MHS), Classes of 1930 to 1939, Shrine Key Stone Cops, Walter Oakes driving the PVHS Driver’s Ed Car, WGUY Van, and 24 Dusters Antique Car Club Automobiles. Also, Dixie Land Band, Dexter Fire Department, Dirigo Horsemen’s Association. Joshua Chamberlain, 10 adult llamas and two baby llamas from LeDuc Llama Farm, two “Pooper Scoopers,” Class of 1947, Class of 1948, Brownie Troop 311, Rublee’s Power Equipment, and Class of 1949. Entity Band, Class of 1943, Sebec Fire Department, Milo Republican Town Committee, Roller Blades, The Mountain Man, Shrine Go Carts, 100th Anniversary Cake by Milo IGA, Replica of MHS by Trask Insurance, Elm Street Park, Devil’s Sledders, CC Polaris, DeWitt Real Estate, Stanchfield Farms, BARCO, Worcester Real Estate, Milo True Value, Project Graduation, Southern Piscataquis County Chamber of Commerce, Milo Water District, Elect Bank, Class of 1944, K&D Mattress, Harmon’s Texaco, and Bridges Construction. Auxiliary with the Antique Tiger, Milo Fire Department Hose Can, Sparky on Milo Fire Department Ladder Truck, C&J Variety, Class of 1960, Class of 1961, Class of 1962, Class of 1963, Class of 1964, Moments to Remember, Class of 1966, Class of’ 1967, Class of 1969 on a bicycle built for two, Class of 1970, Webber Oil, Class of 1968, Shuttle Bus, Honorary Alumni Phil Gerow and Buddy Daggett, and Milo Fire Department’s Rescue 7.
greeting spectators and receiving lots of laughs; Shrine Key Stone Cops who were chasing their escaped prisoners down the street as the prisoners ran into the crowd of spectators and reached in windows of cars to see what they could find; Shrine Go Carts and Mini Bikes; the antique fire units; Dexter Fire Department as they hosed down the street; the replica of MHS; and the Stilt Man as he danced down the street on his stilts. It was truly a marvelous parade that will long be remembered by all who were able to come out and watch it. The remainder of the day was spent with teachers and students from MHS reuniting and with people browsing all the tables along Main Street in order to make purchases of items ranging from crafts and hats to MHS memorabilia. The Milo High School 100th Anniversary celebration brought Milo the biggest 4th of July weekend in many years. More people and traffic were in town than anyone expected. The display of fireworks on Friday evening was “awesome” as one small viewer exclaimed. The Parade on Saturday morning was outstanding and had a wide variety of attractions including a certain pharmacist doing rolls overhead in a bi-plane. During the day on Saturday some classes held reunions in rooms set aside at PVHS and visited around town meeting old friends and reminiscing of old times. The large turnout for all the events proved that school spirit is alive and well in Milo. MHS alumni returned from far and near to be a part of this celebration. This loyalty goes back to the days before TV when the local school was at the center of community life. The sport teams, plays, minstral shows, and prize speaking contests provided entertainment for the community. It was not unusual to see parents and grandparents at school proms. This weekend Milo remembered the greatness of those school years and had a wonderful reunion. Alumni Association co-presidents Eben DeWitt and Neil Hamlin displayed the Proclamation given by the Maine State Legislature in recognition of this 100th anniversary. 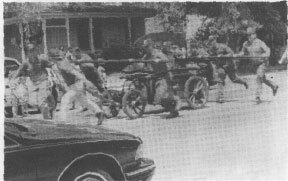 It was initiated by Rep. Jon Rosebush and co-sponsored by Senator Steven Hall. Merna Angove Ricker. Chairman of the 100th Anniversary Committee, got to cut the first piece of the Anniversary Cake. This piece went to Pearl Morrill Hamlin who was the oldest graduate attending. The cake, decorated with black and with icing and red roses was made and decorated by Phil Gerow. 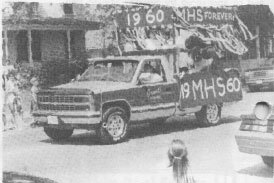 It proclaimed “MHS FOREVER”, a large 100 on the top, a black panther and the years 1895-1995. Providing some of the music for the parade, the Anah Temple Shrine Bard from Bangor certainly added class to the parade. The Milo Fire Department showed how fires were fought when Milo High School was new and proved that this old pumper really works. 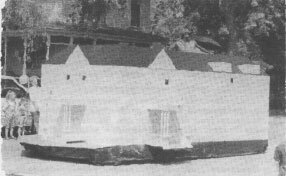 Fred and Lois Grindle Trask provided this replica of the old school. Many wondered how the driver knew where he was going. 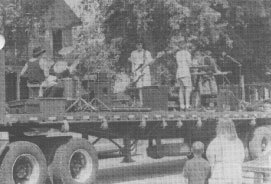 The float for the Class of 1947 was driven by class member Dean Henderson and the float riders were Kaye Davis Trickey, Eleanor Grinnell Cyr, Bob Trickey and Ray Rossignol. 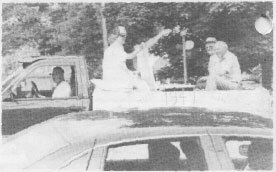 The class of 1960 was all decked out in black and white balloons and streamers. The Class of 1968 provided “the Last of the Best” or maybe they saved the best for last. This class was the last to graduate from Milo High School. At least one member of this class represented the third generation to graduate from MHS. There were more third generation graduates from MHS during the 73 years it was in existence. 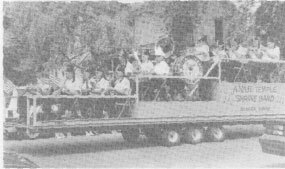 Providing an outstanding sound as they went down the street was “Entity”, a group of 15 year old Brownville students with a great sound. They have no shortage of bookings and played at the Cimmaron Club Saturday night. The Twin City Cloggers of Brewer added color and rhythm. 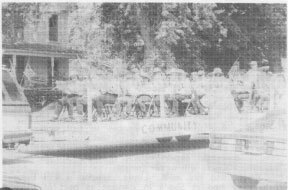 The Community Concert Band participated in their first parade of the 1995 season. They do a tremendous job and add much to any parade. 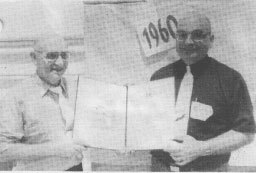 The only two Honorary Milo High School Alumni are Phil Gerow and Neil “Bud” Daggett. No, he couldn’t have been flying that plane, he was in the parade. Right? 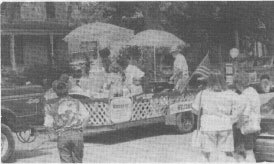 The Worcester Real Estate float cooked and passed out hotdogs and soda to parade watchers. Pond View Llamas of Milo were an unusual attraction at a Milo parade. The gentle, docile animals acted as if parading was all in a day’s work.